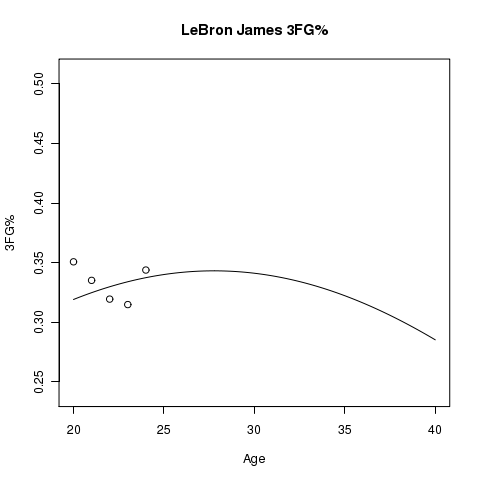 In my last two posts I have taken a look at modeling a player’s 3FG% based on their age, and I’ve also estimated the relationship between usage and 3FG%. 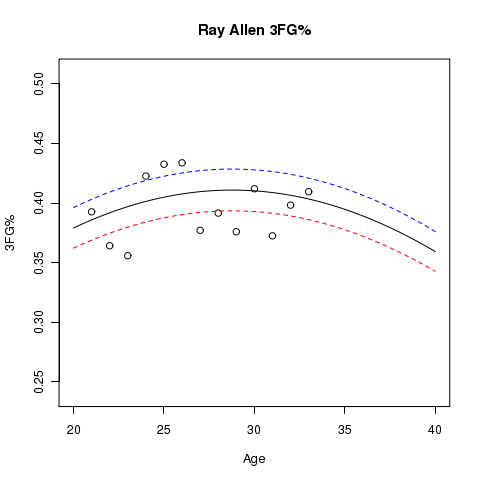 In this post I would like to bring these two topics together and estimate the relationship between age, usage, and 3FG%. To put this data set together I again used Basketball-Reference.com’s Player Season Finder, but this time I collected the advanced statistics to go along with the player’s 3pt makes and attempts. 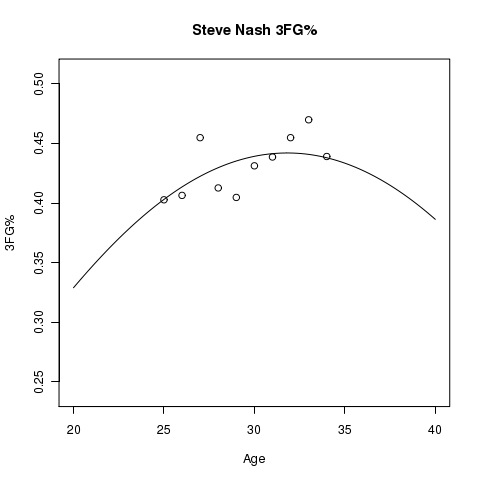 Also, I used more years of data, as this data set is from the 1989-90 to 2008-09 seasons. My original threshold for including the player season in the data set was to require at least two 3pt shot attempts during the season. I have, however, increased this threshold to eighty two 3pt shot attempts in an effort to isolate the data set to only players that we expect to shoot 3pt shots. This means that I’m attempting to quantify those players that are “regular” or “semi-regular” 3pt shooters and disregard those that do not consider the 3pt shot a part of their game. I fit this logistic regression as a multilevel model to allow the intercept and coefficients for USG% and the age quadratic to all vary by player. 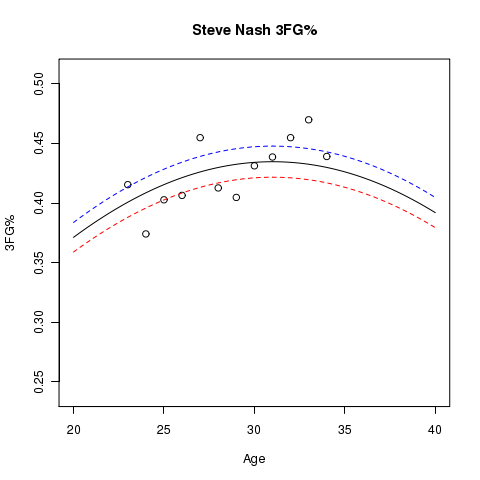 This type of model allows us to estimate the player ability while allowing us to estimate individual USG% lines and individual player aging curves. 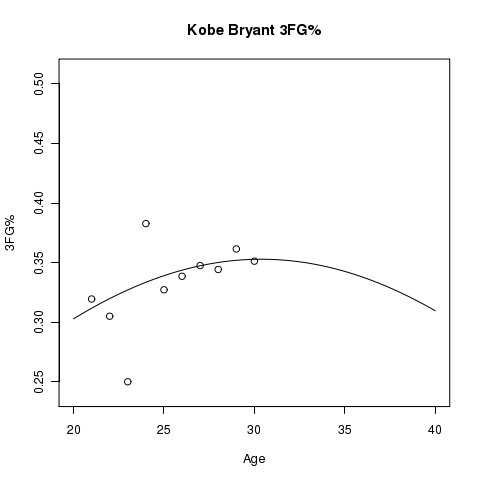 Age: The coefficients for the aging curve, and , suggest that the average player’s peak in 3pt shooting ability occurs when they are 30 years old. One thing you’ll notice is that we only have one data point on this graph. This is because Trevor did not shoot many 3pt shots until last season with the Lakers. That said, using just last year’s data for Ariza we would predict him to shoot 34% this year with the Rockets at age 24 using 23.6% of his lineup’s possessions. Thus far this year he’s shooting 34.3%. 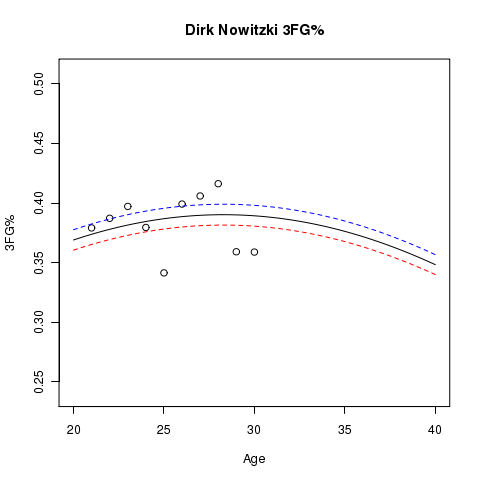 Don’t read too much into the closeness of this predicted% to his actual%, as a 95% confidence interval for his 3FG% this year is (26.6%, 42.8%). One thing to note is that this model suggests that last year’s 31.9% performance isn’t a fair representation of his true ability. This model estimates his fair ability of making a 3pt FG attempt to be 34.3% last year with the Lakers at age 23 using 16.7% of his lineup’s possessions. The next step is to try and validate these models using out of sample data. One thing I would like to do is to use cross-validation to measure the expected prediction error of this model. Also, I would like to quantify the uncertainty around these estimates. Current efforts to do this have left me unsatisfied, but there are certainly some confidence bounds we could generate for these estimtes, and they should prove to be worthwhile to create. NBA Power Rankings: @kpelton‘s recent Basketball Prospectus article inspired me to rank and rate NBA teams using some of the more recent tools I’ve added to my toolbox. You can find these power rankings at the new NBA Power Rankings section of the website, and these rankings will be updated daily. 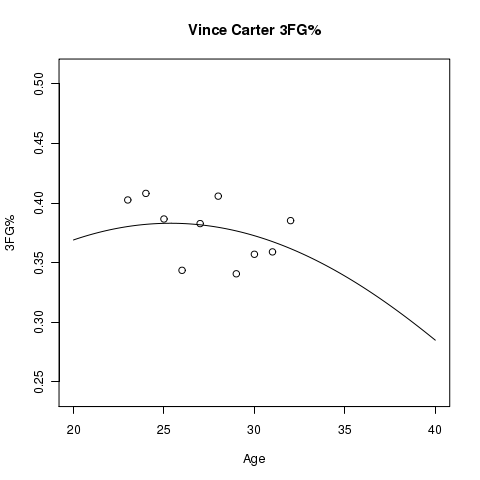 Statistical Scouting Reports: After initially releasing 2008-09 offensive statistical scouting reports, I’ve added 2009-10 data to go along with 2007-08 and 2006-07 data. One word of caution about the 2009-10 data: if you see range values that have the same numbers on the left and right (i.e. 50%-50%), then this means the models do not detect a difference between players at that position for the given statistic. This means we don’t have enough data yet, so don’t go too crazy when you see these kinds of numbers for some player statistics. I’ve also added some defensive measures to these reports. I’m not satisfied with the current groupings of some of the stats, so if you have any suggestions please voice them. Play-by-Play Data: I’ve created an archive for last year’s 2008-09 play-by-play data, and you can now download play-by-play data from the 2009-10 regular season. The 2009-10 play-by-play data should be updating on a daily basis. Please let me know if you find any errors, and enjoy! I hope you find these updates useful!